The makers of this month's enjoyable Enslaved: Odyssey To The West will offer a $10 downloadable expansion to their game soon. It will let people play the game in 3D. And it will let us play as horny fatman Pigsy. "Pigsy's Perfect 10," as the expansion is called, puts players in control of the comic relief from the main game. Pigsy is the star in the add-on with a "mechanical sidekick" named Truffles at his side. A press release about the expansion indicates that the Pigsy chapter is set in the Titan Graveyard. 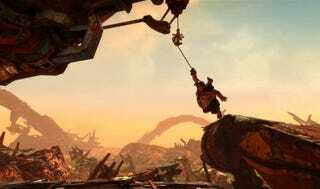 Screenshots and trailers imply that means a return to the junkyard area from the base game. The landscape (and perhaps some of the graphics) will be familiar, but the gameplay will change. Pigsy's gameplay will have a completely different gameplay dynamic, with a focus on stealth and sharp-shooting. He has plenty of tricks up his sleeves including a far-reaching hookshot, trusty sniper rifle, various grenades and devices, Trouble Vision eye piece and the aid of his trusty mechanical sidekick Truffles. The $10 add-on will also let Enslaved be played in 3D, in stereo 3D for people with regular HD TVs and with TriOviz-enabled 3D shutter glasses on 3D TVs. The Pigsy/3D DLC add-on is slated for downloadable release later this year.